Hexx Kitchen and Bar offers breakfast, lunch and dinner all day, every day. 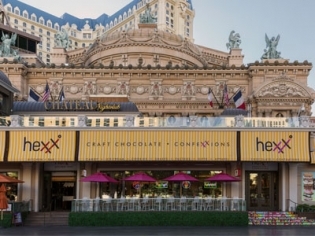 With an extensive bar menu, wine list and adjacent candy store providing some decadent desserts, you can’t go wrong. With Strip-side patio dining with views of the Bellagio Fountains, it is a great place to grab a meal. Have a glass of wine with the cheese and charcuterie tray or go for the Kobe beef burger or the roasted branzino. For dessert, you can’t miss with some of their house-made chocolate or ice cream. This is a great place for large party dining as they have a private room available.